Local legends abound about this cemetery known as Pioneers Rest Cemetery or Bandli Graveyard (after the family who maintains it). One says that a man killed his wife and four children and then hanged himself in his barn, next to the graveyard. Another claims that a Satanic cult used the barn for religious rituals. And a third story tells of two boys were playing tag here after dark when hand reached out of a grave and grabbed one boy’s ankle. He died of fright. The other boy’s body was found outside the graveyard. Some witnesses have reported apparitions, including that of a young girl sitting in a tree. i live right next to the grave yard and i know its haunted. i was walking my dog past it and he started whinning and yipping like he was in pain. he layed there for about five minutes and i tried to drag him away and once i did he was fine. Do you know of anyone I could talk to or even you of what stories are going around the area of why it may be haunted? My cousin and her friend who lives near this area asked for me to go with them and drive through. Im not a believer AT ALL. So i thought it would be funny to scare them. So we drove over the bridge faster than 30 my car lights would not come back on, then the alligator clip that was Jerry rigged to the battery came off…and that has never EVER happend so i made mu cousin get out and put. it back on. It was around 1am. We stopped to walk to the grave yard and up super high in a tree was a white blurry shape of a young child with long hair, i had it o ran back to my car and couldn’t get in, the car wasnt locked after a couple minutes of pulling it opened. I will never not believe in ANYTHING again. This was about 7 years afo…my brother had a visit there as well…very creepy!!! This from about two years ago. 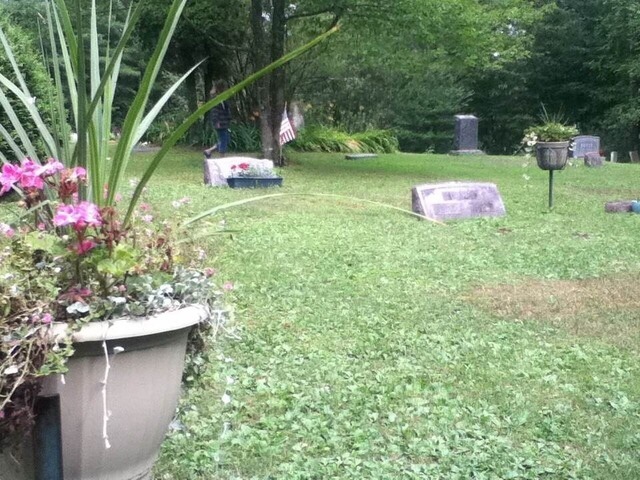 We first heard about the urban legends then went to go to the cemetery durning the day so it wouldn’t be to frightening. Durning the day doesn’t seem so bad. We took pictures, look around at the gravestones, didn’t notice anything. Later when looking through all the pictures we took, we found this. I’ve never experienced any type of paranormal phenomena before. This picture still gives me goosebumps to this day. The first thing I noticed was the white face behind the flag and that was before I read Shane’s reply. What an awesome picture. I have respect for the dead. My way of believing these spirits are still present there is… just leave them alone. They are in a state of rest until the day they are raised for judgment. Please pray for their souls. I live less than a mile from here. Been by countless times at night and day. Never seen anything, and I look very intently. I have never been here, but I do know a few people that have. They have all had something happen to them while they were here. One time they saw a black mist coming towards them, a bright light that was growing from the woods follow them, they had one even follow them home. They are still very frightened to this day of that cemetery and refuse to go back. my sisters and i like to ghost hunt and have all the fun equipment. we went there one day because we heard of all the stories but didnt believe them. we got nothing on the evp or photos but when we were leaving i had the video camera rolling and as we were driving over the bridge i swung my ” camera back into the car and as it passed the side mirror on my drivers door it clearly shows a “man standing behind our car but there was no one there when we drove over it. i still have the video somewhere around here.